Learn to make Aloo Poori Recipe | Puri Sabji Recipe Video | Aloo Ki Rasewali Sabzi With Puri recipe with a video tutorial. Aloo Poori is a North Indian breakfast-lunch recipe. 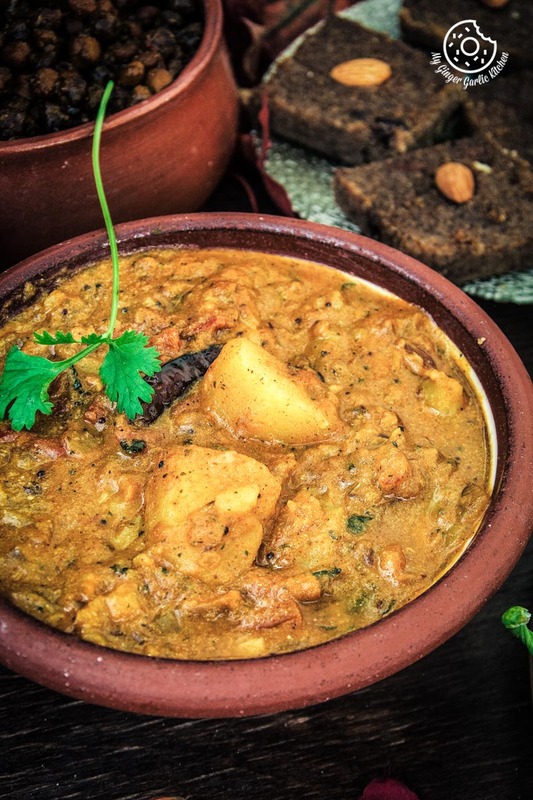 ‘Sabji’ is a spicy, aromatic and tangy potato dish. This is served with puffed up, deep fried Indian bread ‘Poori’. Hope you guys had a great past week. My last week was good and productive too. I finally finished up some important tasks which were long due, and happy about this accomplishment. 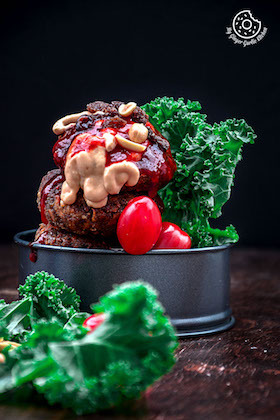 Today I have a very special recipe to share with you. The breakfast-lunch meal I am sharing today is named as ‘Aloo Poori’, or ‘Poori Sabji’. 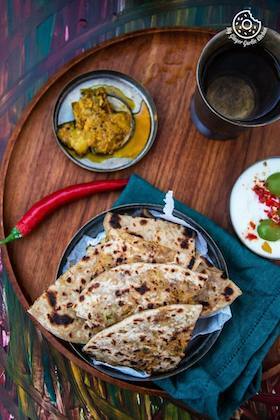 This is a very popular breakfast-lunch recipe in Northern Part of the India. I have been making this breakfast ‘aloo poori’ aka ‘poori sabji’ often lately. You can count ‘often’ since the start of 2017. But I realized that I haven’t shared it on my blog yet. So I decided to share this. However, I was also waiting for a perfect timing to share this, such as some festival. So I planned to share this before the festival of ‘Karwa Chauth’ which was celebrated yesterday. However, that couldn’t be done last week due to some work commitments. But I guess, it’s never too late to share a good recipe. Right? For my Indian friends, who are celebrating** ‘Diwali’**, this ‘Poori Sabji’ would be a great dish for the whole family. My reply is sometimes ‘yes’ or sometimes like this: “Not this weekend, but I can cook it next weekend”. And she makes sure to keep reminding me about the upcoming weekend’s ‘Poori Sabji or Poori Bhaji’ breakfast I promised to her. Furthermore, most of the times her dedication leads me into making her favorite meal much before the weekend itself. Sometimes I feel, how much we have to learn from the children. These children are so determined. They know exactly what they want, and they never stop working towards getting it. They just never give up. Coming to the recipe, in most North Indian families, this hearty meal is served as a weekend breakfast. However, at my home, it was served as full meals (breakfast, lunch, dinner) depending upon the time of serving. Although if you ask me, I personally didn’t like ‘Poori Sabji’ for breakfast much, but I surely enjoyed them as lunch. Now, I love to eat this breakfast once in a while, but not every other weekend. However, my preferred breakfast meals were all types of parathas and I must say they are still my favorite. Whenever I intend to make Indian breakfast, they come first to my mind. 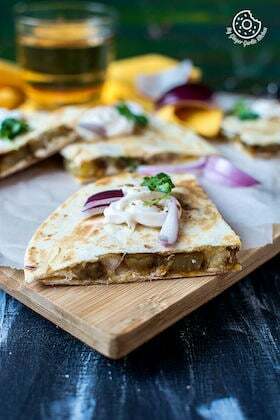 Be it Aloo Paratha, Rajma Tofu Paratha, or Mooli Paratha, Patta Gobi Ka Paratha, Mushroom Kale Stuffed Paratha, Pepper Onion Potato Paratha, Aloo Palak Paratha, or any other paratha. I JUST LOVE any type of ‘Paratha’. A similar type of breakfast to ‘Aloo Poori’ is ‘Poori Bhaji’. Pooris are the same for both combinations, the only difference is in the potato-based spicy side dish. 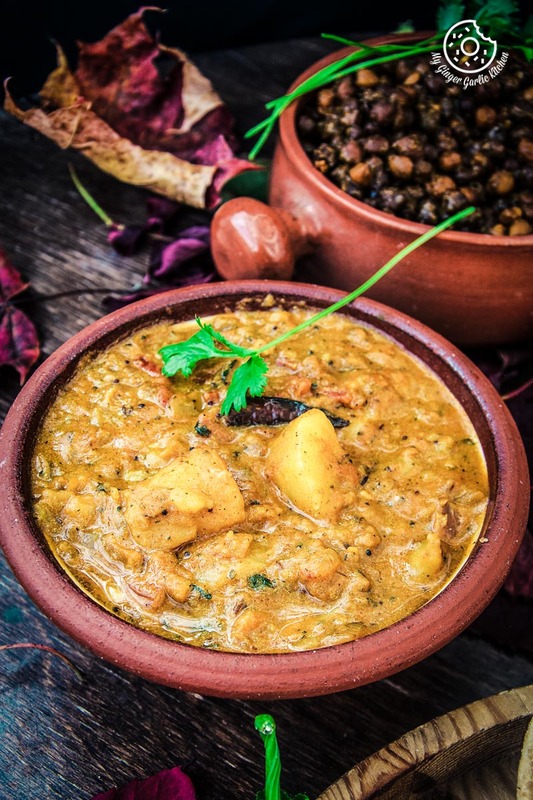 ‘Bhaji is a dry dish and Sabji is semi-liquid’. I have made both Bhaji and Sabji for yesterday’s festive dinner. I also made another popular version of Indian poori which is ‘Palak Poori’ aka ‘spinach fried bread’ and planning to share ‘Poori Bhaji’, and ‘Palak Ki Poori’ soon. 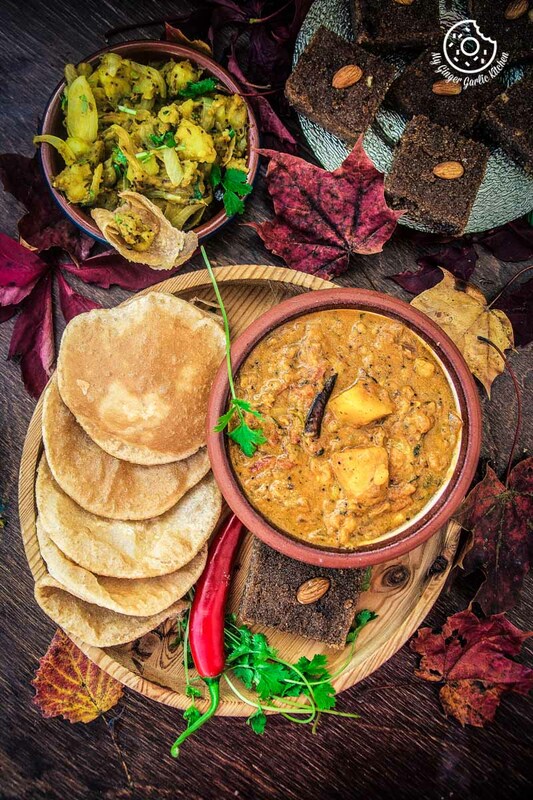 The sabji recipe I am sharing today is ‘Halwai’ (confectioner or caterer) style recipe which is normally served during Indian weddings and parties. This is one of my family’s most trusted aloo sabjis. Everyone in my family just loves this version of aloo ki sabji. This combo of hot and puffed up pooris with spicy potato sabji is the best. 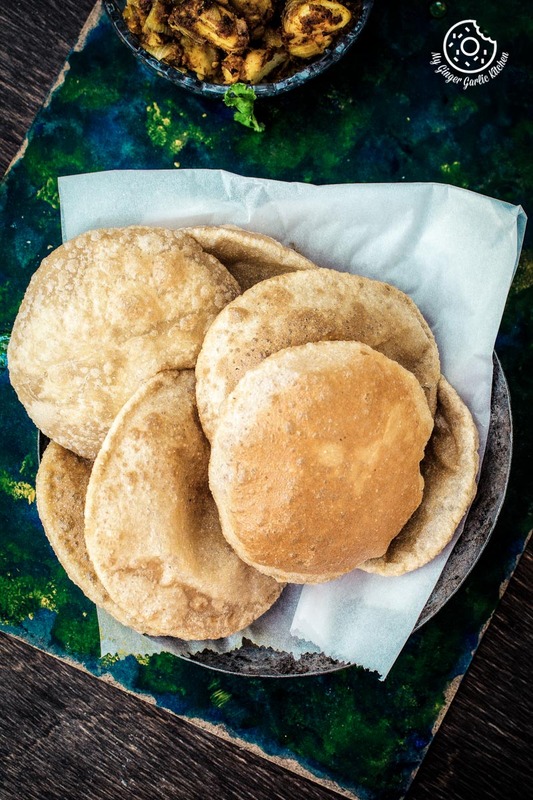 A basic Poori is a deep fried Indian bread made with ‘atta’ aka whole wheat flour. This poori is usually served as a side-dish. There are many versions of pooris depending upon the addition of ingredients. In this recipe I have shared the poori dough recipe made with whole wheat flour and semolina aka suji. 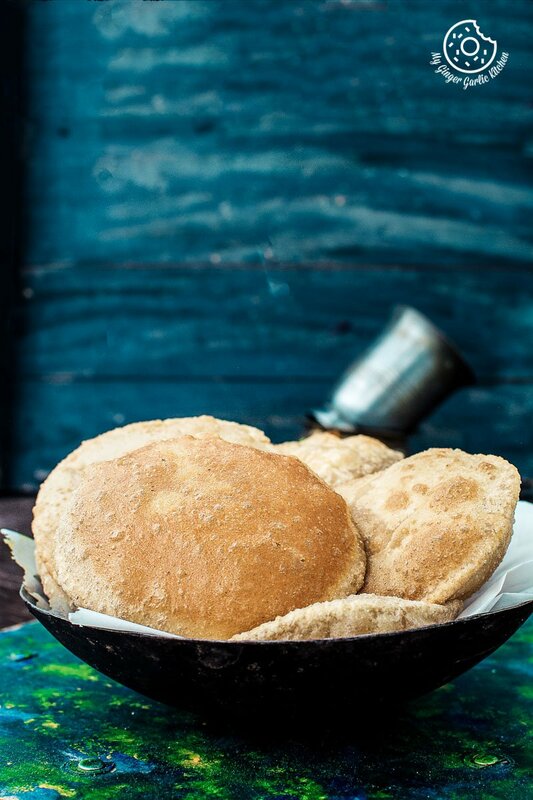 But for those who don’t want to add suji, they can try this poori recipe I have shared earlier. What is Aloo Ki Sabji? 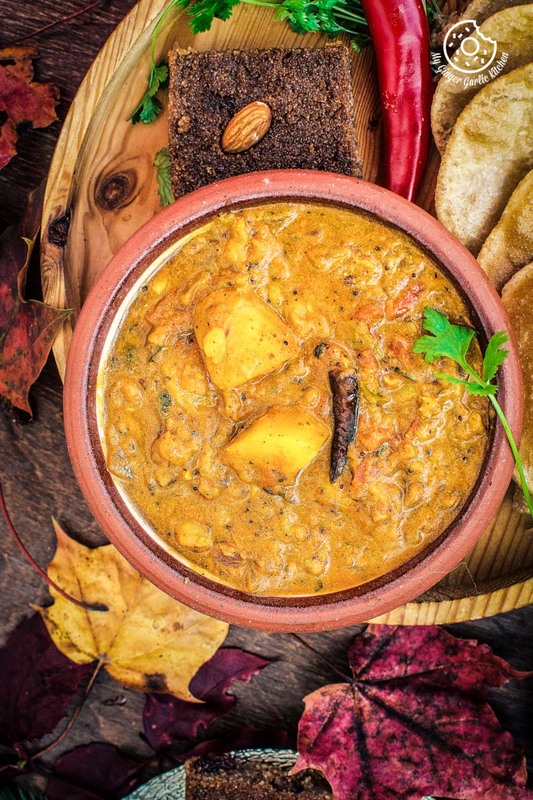 This is a spicy and tangy potato curry made with potatoes, spices, tomato, and yogurt. Just pair it with some hot pooris and some pickle and you get a complete and satisfying meal. 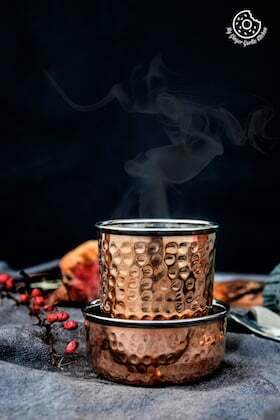 This makes a comfy meal during cold days. 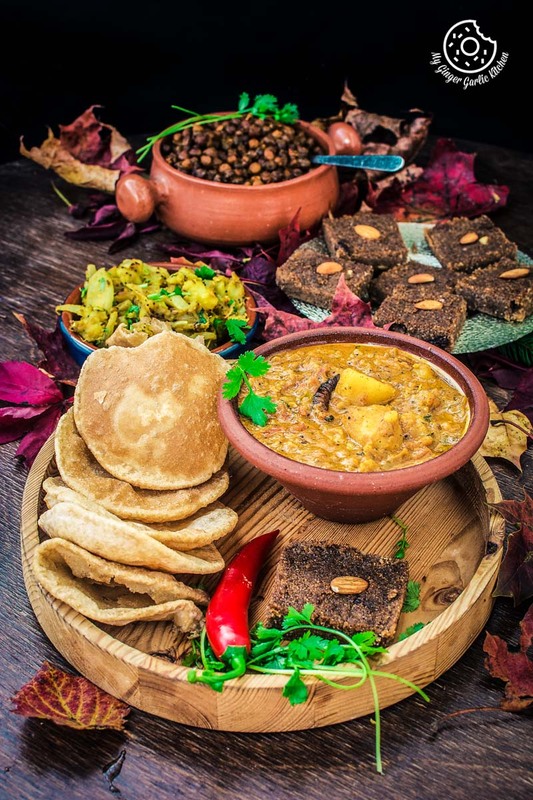 Aloo Poori Recipe | Puri Sabji Recipe | Aloo Ki Rasewali Sabzi With Puri — This is a North Indian breakfast-lunch recipe. 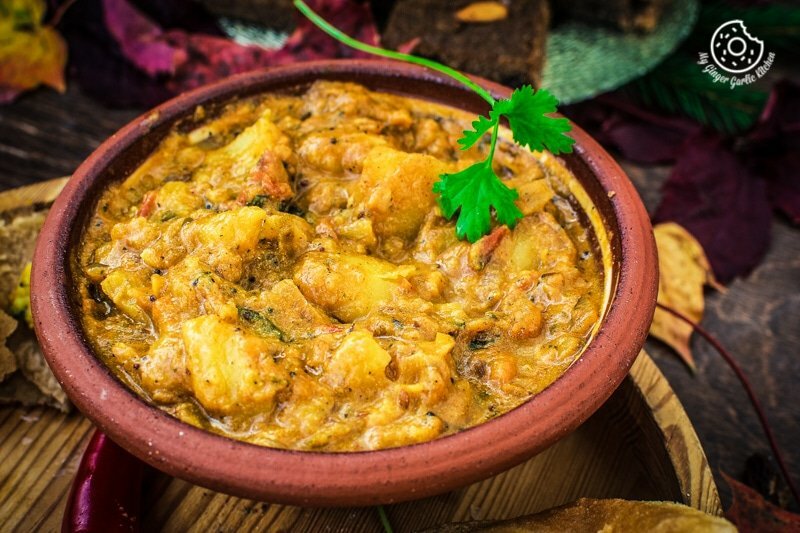 Sabji is a spicy, aromatic and tangy potato dish. This is served with puffed up, deep fried Indian bread poori. 1. Combine the whole wheat flour, semolina salt and 2 tbsp of oil and mix well. 2. Knead into a stiff dough using enough water. 10. Transfer to a kitchen towel. 1. Heat 3 tbsp oil in a pan on a medium heat. 2. Add bay leaf, dried red chilies, cloves, cinnamon stick, cumin seeds, mustard seeds, and asafetida. 3. Once the seeds start to splutter, add chopped garlic, chopped ginger, and chopped green chilies. 4. Let them sauté for 2 mins or until they turn golden in color. 5. Add chopped onions and let them sauté for 5 mins or until translucent. 6. Now add coriander powder, red chili powder, turmeric powder, and salt. 7. Stir well for a minute or you see oil releasing from the sides. 8. Add chopped tomatoes and stir well. Cook for 2 minutes. 9. Add 1/4 cup of water and cook for 5 minutes, keep stirring occasionally. 10. Add crumbled potatoes and stir well. 11. Add 3/4 cup of water and cook covered for 10 minutes on medium-low heat. 12. Uncover and add whisked yogurt and cook for 5 minutes. Add more water if needed. 13. Add garam masala powder, chopped coriander leaves, and kasuri methi. 14. Stir well and cook for 5 more minutes. 15. Remove from heat and serve hot with pooris.